Painting tiles doesn’t have to be as tedious as it sounds. With Mica’s Easy Tips you’ll have a transformed room in no time at all! Before working on the actual tiles, pay a visit to your local tile retailer and buy a few tiles as close as possible in feel and texture to those you will be painting, and experiment on them first. You might even be able to pick up a few broken tiles for nothing and practice on those. First of all, the tiles must be absolutely clean – no dirt, mildew, fat residue, soap residue etc. So use a good household cleaner and a scouring sponge to get that sorted. After cleaning the tiles, give them a final wipe-down to ensure the surfaces (including the grouting between the tiles) are clean. Apply an interior masonry filler where necessary to fill any cracks in the tiles, chips etc. and allow the filler time to cure completely. Back to cleaning… give the entire surface (not forgetting the grouting) a good wipe down to remove any debris from your sanding operation. Now to prime the surface: apply a tile primer. An epoxy or urethane bonding primer provides an ideal surface for the paint to adhere to. An epoxy formula usually is the best option because it offers the most durability, and you can top it with any type of paint. When it comes to the paint itself, opt for a high-gloss or semi-gloss formula. You can use a latex, oil or epoxy paint. Latex usually dries quickly, but it has a softer finish that can tear off if the surface is scratched. 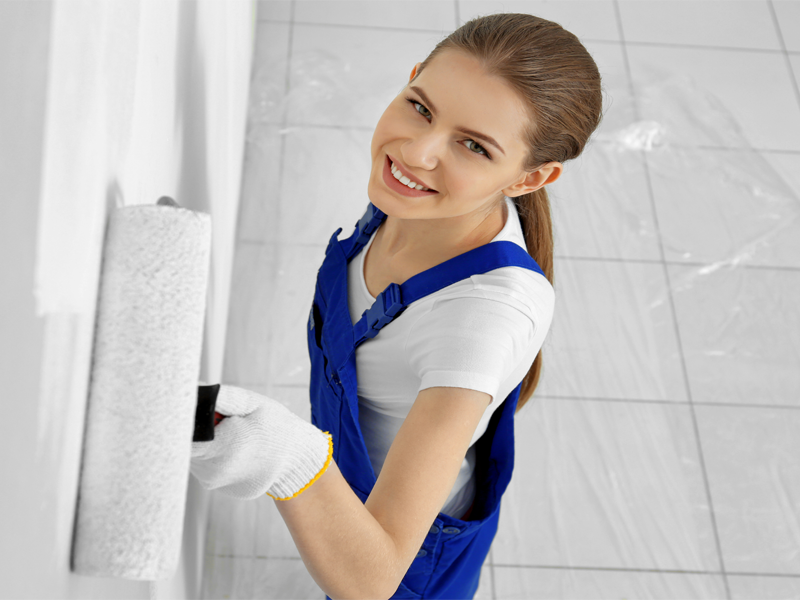 Oil-based paint takes longer to dry and is harder to clean up, but its finish usually is more durable. If you’re painting the ceramic tile around your kitchen sink or on the floor, opt for epoxy paint, which generally is the most durable. When it comes to applying the paint, slow and careful is the way to go. Applying a thick, heavy coat of paint in an effort to finish faster is not ideal as the thicker the layers the more likely the paint is to peel or tear off. Rather apply a number of thin coats, ensuring that you give each coat ample time to dry properly before applying the next. If applying gloss, a very light sanding between coats using a fine grit paper (220 or higher), other than the final one, will ensure each coat adheres properly. When you’re happy with the result, as an option you can allow the paint to dry for two to three days and then apply a clear top coat to help protect the painted tiles from moisture, scratches and other surface damage.